There are no special requirements for X-Plane to run SmartCopilot. The one thing to care about is making sure X-Plane application is not blocked by the firewall and can access the network. When X-Plane starts for the first time on Windows it asks the user to add the firewall rule. Important is to allow the access! Currently, the plugin works with X-Plane 10 and X-Plane 11 on Windows, Linux, and Mac OS. After buying the plugin, a license file automatically will be sent to your PayPal e-mail. Please save this license file to the plugin folder and restart X-Plane. If the e-mail with license file didn’t come for some reason, please contact us at [email protected]. If the plugin is successfully licensed no DEMO mark should be seen on the main window. Plugin in Demo mode gives the possibility to check connection and aircraft compatibility. It could be connected to the Pro or even another Demo user – however, only one user will be able to send manipulators and commands. The Demo user will fly like an observer only. For the plugin to work correctly you should be able to set-up a direct connection between two computers. This usually means fiddling with your LAN settings on your router and configuring port forwarding. There are two ways to establish the connection. Server and Client are not the same as Master and Slave! The Master-Slave status could not be changed during active flight session! To connect each other both SmartCopilot users should set up their plugins. 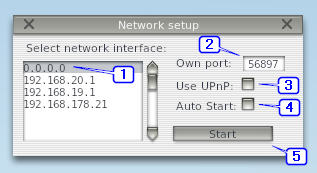 The settings are divided into two part: Network setup window and Direct Connection window. Interface selector gives the ability to select Network interface used for communication. It shows all available network interfaces. Default interface is localhost (127.0.0.1) or “any” (0.0.0.0) which is OK in most cases. If connecting via VPN please select local VPN IP here (X-Plane should be started after VPN is connected otherwise VPN IP will not be seen in the window). Port number – this is a local UPN port for SmartCopilot communication – is normally the port which other clients should communicate to. By using UPnP feature the same external port number will be opened on the home router. 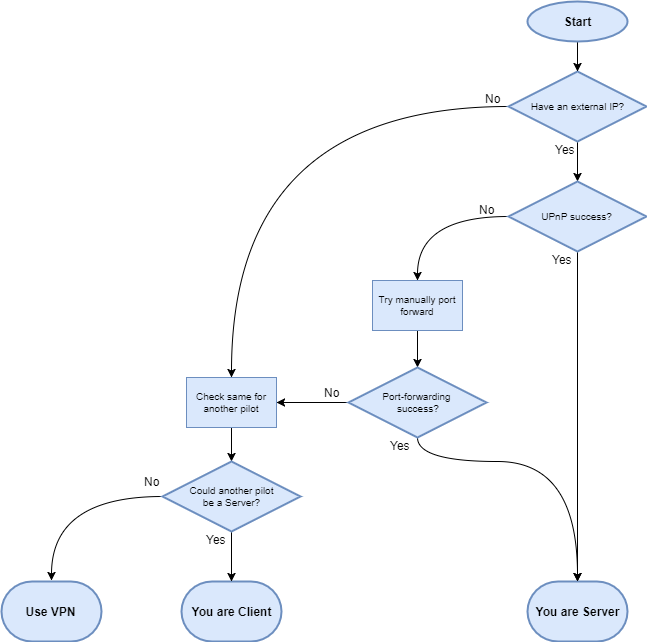 UPnP selector tells the plugin to open UPnP session with home router making automatic port forwarding. The Auto switch enables the plugin to automatically start networking with every X-Plane session. List of available partners (severs). Here could be entered up to 32 records. Select here the user you want to connect to. Every record consists of fields, which could be entered below. The plugin works by reading a configuration file in the aircraft’s root folder. The file is always called smartcopilot.cfg. Just keep this in mind: configuration file must be exactly the same for both participants of the joint flight! If this is not true the plugin will not connect and will notify the user with an error message. On the Download page, you can get configuration files that are available for download. We hope that this database will be updated by us, developers and the user community. Everybody who wants to share own configuration file can register and upload the file to the database. Information on how to create a configuration file can be viewed at Hangar page. So, you know should have configured the computers for a direct connection (through port forwarding/NAT, VPN, Tunneling Voodoo or Black Magic) and your plugin connection settings in X-Plane, you have a co-pilot with your same aircraft and the same smartcopilot.cfg file installed. There is a good chance you might want to start to fly together, in a shared cockpit at this point. Just make sure you and your copilot have loaded the same airport and same weather settings in X-Plane. the plugin management window will appear. The upper and middle part of this window contains information about the current version of the plugin and the current status of the connection. At the bottom, there is a region with three fields/control buttons. The first pilot (or the “Captian”) will leave Master on the bottom left, press the Connect button and wait for the connection from the other party. The second pilot (or the “First Officer”) should select Slave by clicking on the bottom left and then click on Connect. That should work the magic and you two should now be connected and sharing a cockpit over the network. You should see information about the remote host (should show the co-pilot’s IP) and the bandwidth used, plus any error that there might be (hopefully none). From this moment on the plugin is fully working and you can try to take off. The third button/field (bottom right) indicates who currently controls the plane (who has control of the flight controls). Clicking on this field the First Officer can request control. The Captain will give control (as and if he pleases) by pressing the same button. If the request goes unanswered for more than 30 seconds, it will be canceled. In such a case we would suggest the FO makes sure the Captain is alive. Important – after plugin initialization or loading the aircraft first 5 s connection will be not available.